A. When I was a young housewife and mother I started looking for unique ways to personalize and decorate our home without spending a lot on art-work. I began experimenting and customizing the charts I'd purchased. My one-of-a-kind works of needle art attracted the attention of a shop owner where I took them to be framed. The owners kept asking where the designs had come from. When I explained that I had designed them, they convinced me to sell them through their store. In addition, they introduced me to many influential individuals in our current industry. The Sweetheart Tree was the name of my first design and was subsequently chosen as both our company name and our logo. Q. What are some of the biggest changes in the industry you've seen since you began designing? A. Years and years ago (oops, I'm showing my age by those kind of comments) all designs were hand sketched & then the sketch was transferred to graph paper. Once on the graph paper each symbol had to be hand drawn into each square of the graph (think hand cramps here!) and if you made a mistake you had to start all over - how frustrating was that? The next step in technology was a set of symbols which the designer would rub from a template onto each square in the graph thus transferring the symbol to its proper place...still pretty time consuming but a great improvement over hand drawing. Now we're lucky to have sophisticated design programs for computers. These programs allow designers the ability to see the design in color as it progresses then flip things horizontally or vertically - they also make it easy to change the location of part of the design or switch color palettes with ease. There are also programs to illustrate complicated stitch diagrams and do them so that they are easy to follow. Combining the design programs with word processing programs make it a lot easier to lay out instructions so that the instructions are logical & easy to follow. However, one of the down-sides of better technology is that it's easier than ever for designs to be "stolen" & copyrights violated by being scanned, downloaded to disreputable websites. Like it or not, this is making it harder and harder for those who "design for a living" to "make that living." Q. Do you feel your style has changed over time, and if so how do feel about your older designs now? A. Our designs have changed quite a bit over the years & the changes that I've experienced over the years have certainly had an impact on my work. I'm not following trends. I'm just following my heart & the progression in my designs reflects what has gone on in my life - the logical progression of a family - & my family has always been my number one priority. I've designed birth samplers and other nursery pieces, patterns for holidays, family trees, gifts for teachers, and the list continues to grow. 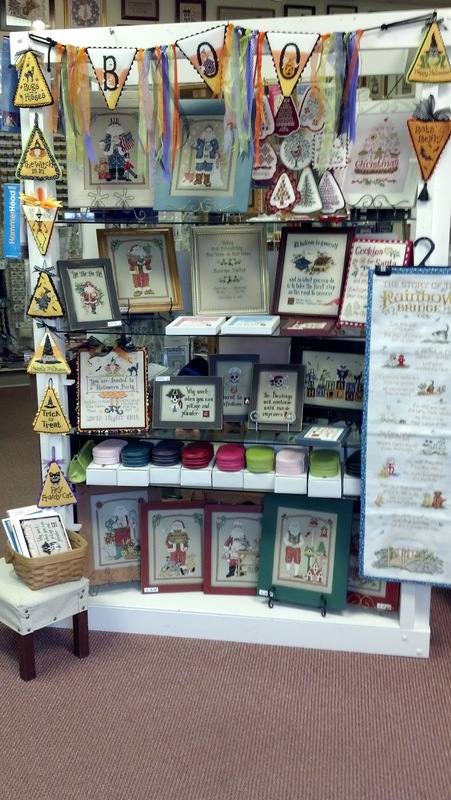 My husband says that we're like the Hallmark store for cross stitchers in that we have a design for almost every occasion-from special occasions like weddings, graduations, and anniversaries to holidays like Christmas, Easter, or Halloween. My personal favorites are our new "Teenie Kits." These are an ever-growing series of small but elegant designs that are embellished with beautiful Silver charms or imported crystal embellishments. They come in the neatest little hinged plastic boxes which are easy to tuck in your purse when you're traveling or going to a little league game. Keeps your fingers moving by having a project always with you. All of our kits are all-inclusive (meaning they have everything you need packed inside – even the needles). They have wonderful color pictures on the front covers – and they're just plain fun to stitch. They give just a bit of challenge, but they don't take forever to complete. Our designs now are more sophisticated than those from the past but there are many oldie-but-goodies from the past that have really stood the test of time....I think that's a good thing. Q. How do you compare the products that are available in today's market compared to 10 years ago, and how that has changed your designs over time? A. When I started designing there wasn't much of an available selection and almost everything was just a black and white graph with no photo at all. Rather rudimentary really, but when you didn't have anything to compare to they sure got the job done. We were first to come up with oblong cards printed in black and white and they were sold at a really reasonable price - stitchers gobbled them up. We created hundreds of designs printed on those cards and sold thousands of them. Then we added charms and embellishments to the designs for 3-dimensional interest. As technology improved the selection grew - now it's huge and you can pick and choose from a multitude of designs & styles - most designs now come printed with a photo so you can see (rather than imagine) what the finished product will look like. A big improvement! Next came high quality kitted items like our Teenie Kits and Special Edition kits. These made getting all the parts and pieces easy for the consumer. As serious stitchers we're SO much luckier today than 20-30 years ago! Q. What would you like to say to your fans that are reading this?A. Gosh, the first thing I'd say is thanks! Thanks for supporting the industry as a whole & supporting The Sweetheart Tree in particular! Each phone call or email I get continues to keep me motivated to continue to challenge myself to create great new designs for you to stitch. I'd also like you to know that you shouldn't ever be intimidated by the appearance of a design and think it's too hard for you to do. All you have to do is take it one step at a time and you'll find it wasn't near as hard as you thought it might be. Challenge yourself to try something new - whether it be a new stitch or a totally new technique! - you'll grow in proficiency - and my, oh my how proud of yourself you'll be at the end! A. We've always had a family critter or two - or three or more - cats, a dog, fish, a bird and a hamster or two....but now we have just one little snuggle-bunny - our Ragamuffin kitten named Muffin. He's a total fluff-ball and a bit of a scaredy-cat when strangers are about - but, my oh my, he loves his Momma and Daddy. Oh?, did I mention he's spoiled rotten? He's a great help in the office too as I'm designing and often "types" on the keyboard when I'm not paying attention. He's been dubbed as my "Junior Feline Design Assistant" and you might want to look for his personal editorials which appear on our website from time to time. Q. What's your favorite holiday and why? A. Can you spell CHRISTMAS?? I love Christmas and usually have the house decorated and ready to rock & roll by Thanksgiving - & that takes a bit of work around here as I put up 7 themed Christmas trees in the house. It takes a bit of organization to get it all done but there's Gold & Ivory ornaments for the family room along with matching wrapping on the gifts, Silver and Crystal snowflakes for the dining room & 30 years of Cross Stitched ornaments on the tree in my office. There are 2 smallish trees in the kitchen - one is filled with teenie Kitchen utensils & for the oenophile in me (that's wine lover girls) there are wine related accessories on another small tree. Tucked in another corner there's an alphabet tree that's decorated with the initials of all of our family members and one decorated with Silver & Golden fruits in the bedroom. I've been threatening to do a Southwest themed tree for a couple of years now but I really don't want to "go overboard" - know what I mean? As each ornament comes out of the box I remember where and when we got it. It's just so much fun & the house looks so festive. Taking it down is another story which we'll go into much later....(smile). Q. Besides stitching and designing, what are a few things you enjoy in your free time?A. I love to cook and entertain. Since moving to Arizona we haven't done as much entertaining but when we do I pull out all the stops and cook "fancy." The more the merrier in the house is my motto. Q. What are your achievements so far? A. If we're talking personal achievements then I've gotta say my kids are my best work! - and what I'm most proud of! They're simply the best! – so smart!, well-grounded and all-round fabulous people. I couldn't have raised such great children though without a lot of help from my husband Dave. He's always been there as family-leader and also as the biggest cheerleader in my work as a designer. If we're talking professional achievements then I guess I'd have to say the top two were being asked to stitch a holiday ornament for The White House (you know, the one at 1600 Pennsylvania Ave in Washington D.C.) and being selected as one of America's top designers by DMC and awarded a trip to visit DMC in France. What a whirlwind of a trip and so memorable to share with other designers in our industry....both are memories I'll cherish for a lifetime. A. What a fun question! I'd probably be a train-wreck! - but in my dreams I'd build a tiny house where I'd have a view of the ocean from the kitchen window....maybe every window! How vast and inspiring that view would be. The house would be Gray with White trim and a DMC 816 colored red front door surrounded by a White picket fence with beds of geraniums and roses, lots of roses! Believe me I've thought about this a lot! - all I have to do is buy a lottery ticket now right? A. I have been stitching since I was a young child. My mother and both grandmothers stitched and I wanted to do everything that they did! My first cross stitch was with black thread on gingham fabric. I was a ten year 4-H member and sewed clothing for many years. I have also knitted, quilted and tatted but don’t seem to make time for them. A. This year marks my 25th anniversary at House of Stitches! A. 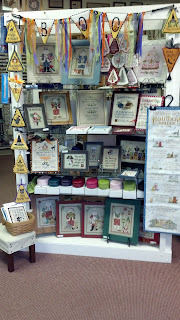 We offer counted cross stitch, punchneedle and needlework framing. A. We have an online store http://www.houseofstitches.com/ and it has been a very good thing for our business. It makes searching for a particular design or product much easier and even our “brick & mortar” customers visit the website to see what’s new and make their shopping list before they come in the shop. Q. How do you compare the products that are available in today’s market compared to 10 years ago, and how that has changed your business over time? A. The products that are available today take our stitching to a whole new level. The hand-dyed fabric and fibers combined with the wonderful beads, buttons and other embellishments give us many more creative options for our projects. Q. What are some of the biggest changes in the industry you’ve seen since you’ve been in business? A. The use of the internet has really changed the way cross stitch is marketed. When I bought the shop, I would phone people to let them know that new charts had arrived from their favorite designer. Now the designs are promoted directly to the stitchers sometimes before the chart is available. Q. What type of events do you offer at your store? A. We offer classes and a Monday afternoon stitching group. Every August we host the “Midwest Stash Exchange” as a fundraiser for Riley Children’s Hospital. (Shameless promotion: it is August 18 this year.) The best way I can describe it is that it is a swap meet/yard sale for needleworkers. We have live music, games for kids, food and much fun! In October this year we are hosting a weekend class called Weekend of Stitches with Ellen Chester from With My Needle. Q. Is there an event or promotion that you offer that you feel is incredibly successful that you’d like to share? A. The Midwest Stash Exchange mentioned above has brought many new people to the shop and involved them in a very worthwhile cause. A. I love spending time with family, especially my two grandchildren. Grace is 7 and Jonathan is 3 and they only live a few blocks away. They can entertain and amuse in ways I didn’t know existed! Q. What’s your favorite holiday and why? A. It is hard to choose between Christmas and Thanksgiving but I think I have to choose Thanksgiving. It has less “hype” and it is easier to celebrate the original meaning of the day. We have a large dining room and for the last number of years we have hosted the meal for anyone from either side of the family as well as anyone they want to bring along. It is easy to count my blessings when surrounded by family, friends and food! A. I can’t limit it to three books! My favorites are recorded books which make it possible to read a book while stitching, doing mundane chores or driving. Until I discovered books on tape and now CDs or Playaways I hardly found time to read. A. My husband and I will celebrate 38 years of marriage this year! His support is the reason I can continue with House of Stitches. We have two children-actually four if you count their spouses!-and two grandchildren. We feel incredibly blessed to have them all living nearby. A. We don’t have pets. It wouldn’t be fair to them since I am at work SO much of the time. Q. What’s your greatest strength? What’s your biggest weakness? A. I always say that my greatest strength and greatest weakness are the same: I don’t know when to quit! Thank you for reading this edition of Norden's Needleworkers - stay tuned - I am hoping to get caught up, and post the feature for SUE HILLIS & YE OLDE CROSS STITCHERY!